i am in love with that ring! that is so gorgeous!!!!!!! i fancy the cartier one though...but great finds!!! I need to make more money, like seriously. The Cartier one is beautiful but that's more than my mortgage payment for a whole year. Yikes!! I'll go with the cheaper one! Im in LOVE with that ring.....soooo pretty!!! eeeek , really ?! 20 grand! ouch! i'll pry be a cheapo! I just can't resist Cartier! That Cartier price tag stings doesn't it. But it's such a classic. For $30 - I'd play along nd get the steal! cheap for me. lovely, too. great ring. i really love the panther ring. I would want the Cartier. HA. So fierce! Oh this are sooo cool! 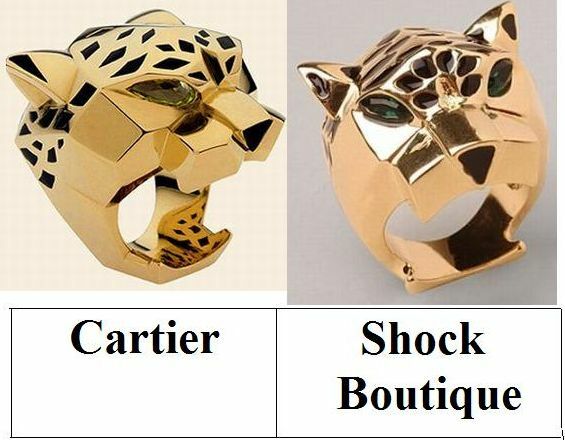 Cartier is my dream but I'll go for the Shock Boutique this time! you have inspired me so i went looking for a panther ring on etsy. bought it! i really love panther rings! and lions too! oh my god, i love it! i'd have to splurge and go for the cartier, it's divine! If I am getting something Cartier it's going to have so many diamonds on it I will have lost count. $30 is definitely doable. It would look great with a LBD. Definitely the right piece to make a simple outfit shine. I actually like the expression on the Shock Boutique, so I'd go that route. Wowza! Love the Cartier one but I'd rather buy a car than a ring :D haha! such a very cool ring. but I don't wear them much..I'd definitely go for the cheaper one. I'm glad you posted about it. I think if one wants to go with something of this feel, the Cartier has a better look. It's not exactly my thing, but I could totally see someone in a leopard print trench coat and red heels rocking this ring. I agree, these are truely purrr-fect, hehe. I adore accessories with animals on them. I love the Cartier one. Rawr!! me likey... but me likey the pricier one.. hee hee. Now, I need to figure out where I'm going to get $20grand! lol. *Swing by and enter to win a $100 GC to Shopbop! Wow, I love these rings. Well this is a fun ring! Def save though- a bit too trendy but def so fun! mmmm... I don't know, I do love Cartier. But in reality I'd probably stick with Shock boutique. love that cartier one. so cool. i love rings like that. Cool look--sadly, though, $30 is still too much for a trendy ring like that to me. Amazing find! Although, it would be lovely to be able to afford the Cartier. What a fabulous match! Love it, my dear. Cartier, no doubt, even though a girl's best friend is always Tiffany's. I so love the Cartier but I could never do it...It's gorge! I think the cheapie version is juuuuuust fine in this situation! Although I could never actually spend that kind of money on a ring, I'll play make believe and splurge! both are lovely but I have to go for the Cartier one..
that's succhcchhh a really great deal ! WOW! How can they be so similar! It is insane! $20 300!!!! I simply cannot believe it I'm so shocked. I'd definitely go for the other one. I love these posts that you do I always find them interesting. both are hot but i could not spend $20k on one ring....so i'll go with the less expensive one. Oh my! Over $20k?! That's just crazy! I'd definitely snag the Shock Boutique ring though. He's still one fierce panther! O.O That Cartier is hot.